Have you ever wondered what makes a car an excellent choice for families? Yes, size is often a major factor along with seating capacity and safety scores. But, what about the other features? Does it actually matter if a car has standard Bluetooth hands-free connectivity or an available infotainment system? What about the engine? Is there such a thing as an efficient SUV? If you are like the typical first-time SUV buyer, some of these questions may sound familiar. But, no need to fear, check out our 2016 Mazda CX-5 review below and get the low-down on some of the essential features that make this crossover an exceptional option for Springfield drivers. 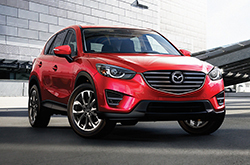 First and foremost, the Mazda CX-5 is a safe option for drivers with precious cargo. Not only does every Mazda CX-5 come standard with antilock brakes, traction control, advanced air bags and an optional automatic crash notification feature, but buyers can also purchase a 2016 Mazda CX-5 in Springfield with the i-Activesense package that includes adaptive cruise control, smart brake support, lane departure warning and automatic high beam control. 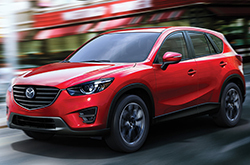 A recipient of the highest possible rating of "Good" in many of the Insurance Institute for Highway Safety's crash tests, the Mazda CX-5 has proven itself a reliable choice. In addition, drivers will be thankful for the extensive features like the Bluetooth hands-free connectivity that offers fewer distractions on the road, available Mazda Connect infotainment center with a built-in rearview camera, folding rear seat backs, air conditioning with pollen filters and remote keyless entry. Add in the charming exterior that now features optional LED headlights along with sleek dimensions and a rear roof spoiler and it is clear that the Mazda CX-5 goes beyond practicality with a contemporary style you'll be proud to flaunt around town. Under the hood, the crossover delivers exceptional agility and efficiency. Whether you are interested in the 2.0L four-cylinder rated at 155 horsepower that comes standard or the 184-hp-rated 2.5L that offers an all-wheel-drive option, there is no going wrong in the 2016 Mazda CX-5 in Springfield. Plus, with EPA-estimated fuel ratings that promise fewer trips to the bank and more money in your pocket, the Mazda CX-5 is a great choice fit for longer carpool days. A top choice in its class according to Edmunds.com's 2016 Mazda CX-5 review, this phenomenal family car is available and ready to be test-driven at our location in Missouri today! We have the courage to ask you to compare the latest Mazda CX-5 model next to other vehicles in its class like the 2016 Toyota RAV4, Chevrolet Equinox and the Volkswagen Tiguan. That's how confident we are that it's the best match for you. 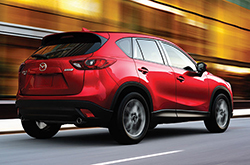 The Mazda CX-5's attractive design, leading-edge onboard technologies and low cost are sure to win over MO shoppers. Many drivers in Springfield choose it because it's a phenomenal value; compare its price to the opposition to see for yourself. Find even more info; see our quick-facts list for the Mazda CX-5 - bullets below this text. Buying a car takes time, research and a little help along the way! That's why Reliable Mazda has provided the Mazda CX-5 review above and reviews of other 2016 Mazda models. Skilled automotive writers put in numerous hours of research to write the reviews on our site. 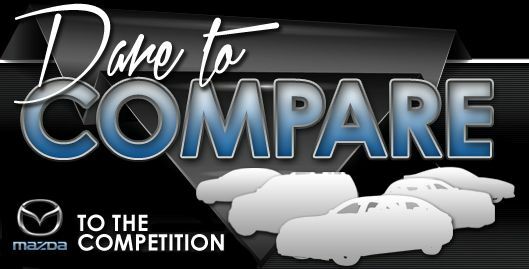 Everything perspective car buyers need to make informed decisions is right here, including info regarding cargo capacity and other specs. Each overview is bundled with accessible material and specs - all at your fingertips. Thank you for checking out Reliable Mazda's 2016 Mazda CX-5 review. Now that you know more about the Mazda CX-5, pick up the phone and call us to learn about exclusive offers and OEM incentives that can help you save a substantial amount on your purchase.